Landnámabók (Icelandic pronunciation: ​[ˈlantnaumaˌpouk], “Book of Settlements”), often shortened to Landnáma, is a medieval Icelandic written work which describes in considerable detail the settlement (landnám) of Iceland by the Norse in the 9th and 10th centuries CE. Landnámabók is divided into five parts and over 100 chapters. The first part tells of how the island was found. The later parts count settlers quarter by quarter beginning with west and ending with south. It traces important events and family history into the 12th century. More than 3,000 people and 1,400 settlements are described. It tells where each settler settled, and it provides a brief genealogy. Sometimes short anecdote-like stories are also included. Landnámabók lists 435 men as the initial settlers, the majority of them settling in the northern and southwestern parts of the island. It remains an invaluable source on both the history and genealogy of the Icelandic people. Some have suggested a single author, while others have believed it to be put together when people met at things (assemblies). The very first copy has not survived; the oldest surviving examples are copies made in the second half of the 13th century or a little later. The initial settlement of Iceland largely took place during the Viking Age between 870 and 930, but Landnámabók mentions descendants significantly later than the actual settlement period, at least into the 11th century. 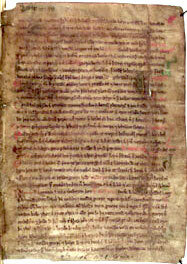 There are five surviving medieval versions of Landnámabók.